1. The 33' long string light is lined up with 100 delicate mini-crystal LED bulbs, glittering and translucent crystal. The 66' buying option is for TWO (2) 33' string lights. 2. Colored metallic copper wire can be bent into any shape; DIY it into a night light or anything you want, satisfying your creativity. 3. Battery operated with timer feature, light up automatically at night. 4. Make your home, holidays and handwork outstanding from others. 1. This 33' long string light makes indoor outdoor decoration possibilities endless. 2. Bendable and flexible colored copper wire. 3. DIY any shape you want as a centerpiece, drop it inside mason jars, wind on your bed, hanging pictures, decorate garlands, do children's school program, wrapped around porches, fences, furniture, crafts. 1. Comes with a compact battery box, not really noticeable and easy to decorate. 2. A 6/18 hours timer allows to set the light for an automatic glow. 3. Press button once to turn on at the same time every day for 6 hours then light up again after 18 hours automatically; Press twice to turn on constantly. 4. Ideal for bedroom, wedding, party, Summer BBQ, Christmas, shows, home decor etc. 2. No more tangled mess of cords or searching for an outlet. 1. Press button once to turn on at the same time every day for 6 hours then light up again after 18 hours automatically; Press twice to turn on constantly; Press three times to turn off. 2. Do not make too much twisting or the coating lacquer will fall off and the light will short circuit. ELEGANT MINI-CRYSTAL LED STRING LIGHT - The 33' long string light is lined up with 100 delicate mini-crystal LED bulbs, glittering and translucent crystal. The 66' buying option is for TWO (2) 33' string lights. - Colored metallic copper wire can be bent into any shape; DIY it into a night light or anything you want, satisfying your creativity. - Battery operated with timer feature, light up automatically at night. - Make your home, holidays and handwork outstanding from others. 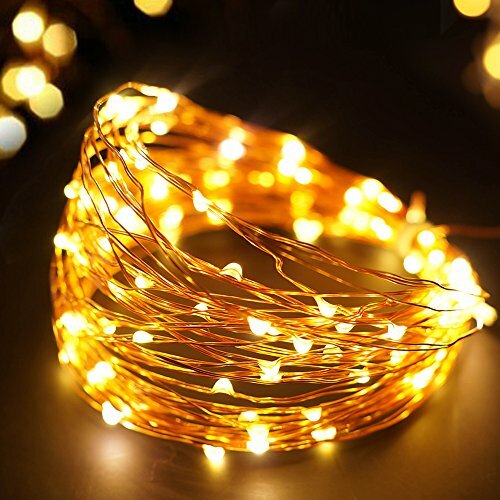 33' FT LONG STRING OF 100 STARRY MINI LED BULBS - This 33' long string light makes indoor outdoor decoration possibilities endless. The 66' long 200 LEDs buying option is for TWO (2) 33'string lights. - Bendable and flexible colored copper wire - DIY any shape you want as a centerpiece, drop it inside mason jars, wind on your bed, hanging pictures, decorate garlands, do children's school program, wrapped around porches, fences, furniture, crafts - Effortlessly make any space stunningly special. TIMER FEATURED & VERSATILE - Comes with a compact battery box, not really noticeable and easy to decorate. - A 6/18 hours timer allows to set the light for an automatic glow. - Press button once to turn on at the same time every day for 6 hours then light up again after 18 hours automatically; Press twice to turn on constantly. 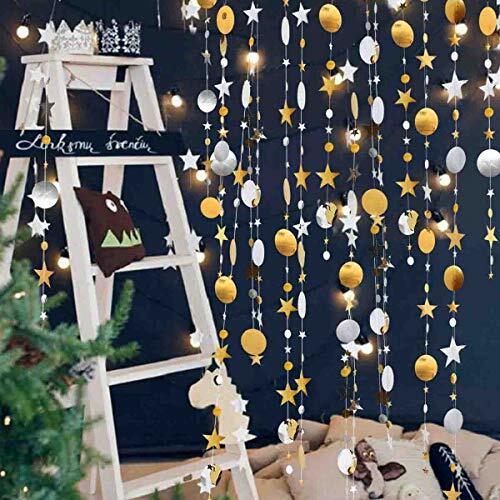 - The starbursts make the string light a charming decoration for any occasion. - Ideal for bedroom, wedding, party, Summer BBQ, Christmas, shows, home decor etc. ENERGY SAVING & EASY TO INSTALL - No wiring required, fast and easy to install. - No more tangled mess of cords or searching for an outlet. - Long lasting LED bulbs stay cool to touch after long-time use. - Provide energy saving while enhancing your home atmosphere. - The copper wire coated with insulated lacquer; LED bulbs are waterproof design. - Wrapped around a cardboard tube, convenient for reuse and storage. - Comes in a gift box, ready for gift giving to friends, relatives and loved ones. 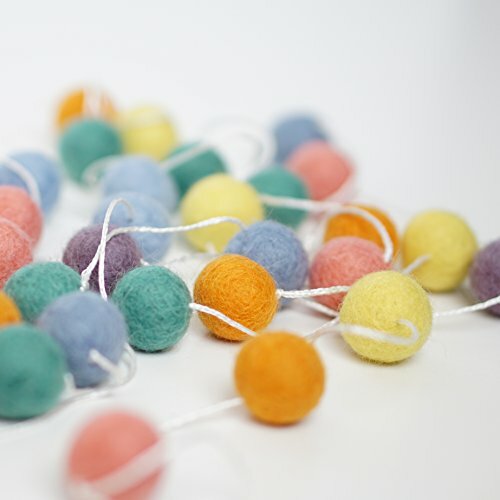 Our Ball Garlands are made from high quality, durable Wool and are make the perfect addition to your decor. Use them year after year. They will soon be a favorite tradition. Our Garlands are sturdy and durable unlike paper or cardboard garlands! These will last! Each garland measures 9 FT long. Our garlands are made from 100% Wool that is durable and will last. Each ball measures approximately 1 in in diameter. Comes with 35 balls all strung together. 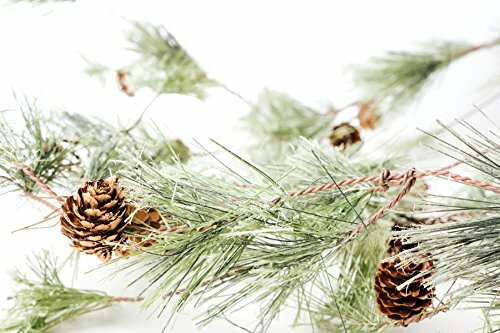 Take care in storing your garland and it will last for many seasons to come. We recommend avoiding wrapping or looping the garland when storing. Instead, lower each ball, one at a time, into a small bag or container. This way, the garland will not tangle. FIVE strands of 14 feet each, for a total of 70 feet red and white paper garlands. 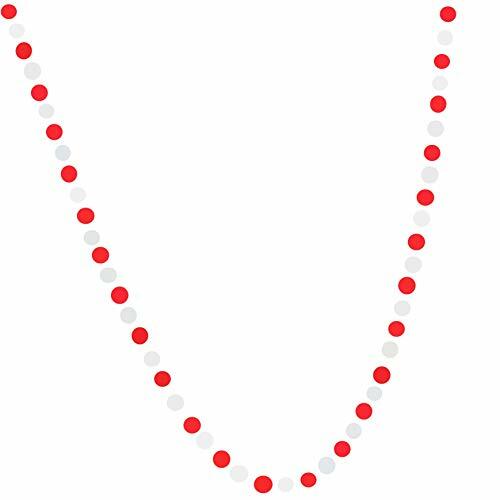 Each of the 5 red and white garland strings is 14 feet long and can be cut to your desired party decoration length. There are roughly 58 - 2 dots per string. Festive decorations for a Minnie or Mickey Mouse Party, Dr Seuss, Birthday and many more red themed parties. Easy to setup, each garland is pre-strung / sewn so you simply open the package and hang. Careful not to tangle when opening. Perfect for all parties decoration such as baby 1st birthday, children or adult birthday, baby showers,nursery christening, wedding/engagement/Anniversary, Bridal Shower,graduation/grand events and any other celebration. 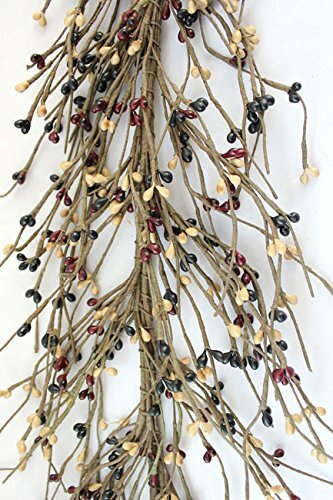 each garland length 13ft,total 4pcs. high quality product from Sumwey Brand if you think have any quality questions,pls tell us,100% money back! Aloha! Have fun under the sun and enjoy the party with this Tropical decorations kit and matching tableware set. Don't miss this amazing summer tropical Flamingo birthday party/Flamingo birthday Aloha party Flamingo birthday party Hawaii party Backdrop! Love the birthday cake!! See more party ideas and share yours at Qian's Party! 3 - Fushia Honeycomb Balls 8"
3 - Yellow Honeycomb Balls 8"
1 - Mint Tissue Paper Fan, 10"
1 - Orange Tissue Paper Fan, 10"
1 - Cream Tissue Paper Fan, 10"
1 - Teal Tissue Paper Fan, 10"
1 - Mint Tissue Paper Fan, 14"
1 - Orange Tissue Paper Fan, 14"
1 - Cream Tissue Paper Fan, 14"
1 - Teal Tissue Paper Fan, 14"
Aloha! Have fun under the sun and enjoy the party with this Tropical decorations kit and matching tableware set. Don't miss this amazing summer tropical Flamingo birthday party! Love the birthday cake!! See more party ideas and share yours at Qian's Party! 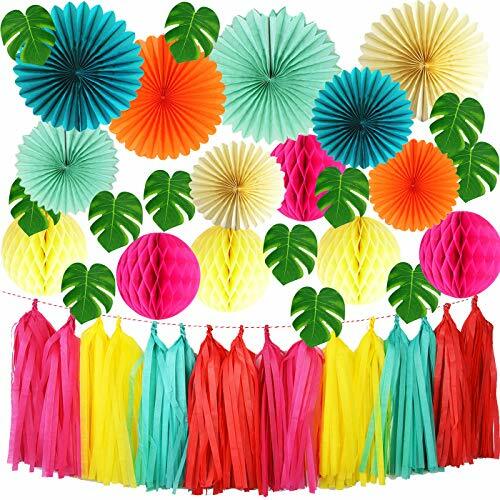 Tropical birthday Party decorations Flamingo birthday Aloha party Flamingo birthday party Hawaii party Party kit includes:6pcs honeycomb balls(3*yellow+3*fuchsia); 8pcs paper fans(Orange/Mint/Cream/Teal)+1 pack of tassel garland+12pcs tropical leaves. 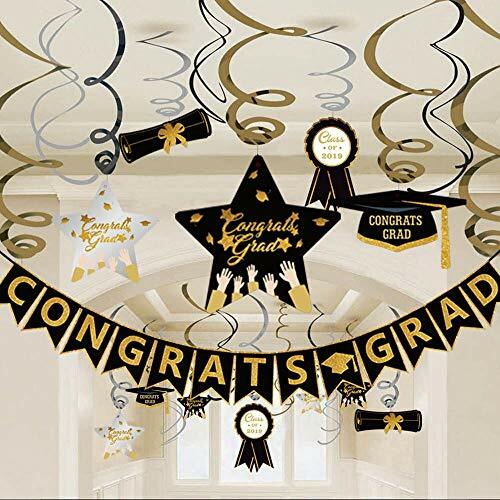 Premium quality tassel garland/balloon tail, handmade from high quality premium tissue paper with much attention and care. Whimsical chic decoration for your next event! Tropical birthday Party decorations Flamingo birthday Aloha party Flamingo birthday party Hawaii party/Backdrops & Props luau decorations summer party tropical decors birthday party kit luau party hawaiian party theme flamingo decors pineapple decors. Tropical Palm Leave look like the real leaves.Make your guests feel like they're in paradise with these realistic leaves. Use as a table scatter all over the an event venue, beach party, jungle party, Hawaiian luau theme party and birthday party,etc. FIVE strands of 14 feet each, for a total of 70 feet black and white paper garland. Each of the 5 black and white garland strings is 14 feet long and can be cut to your desired party decoration length. There are roughly 58 - 2" dots per string. Festive decorations for a New Years eve party, retirement party, graduation party, over the hill 40th, 50th or 60th birthday, and so many black themed parties. Easy to setup, each garland is pre-strung / sewn so you simply open the package and hang. Careful not to tangle when opening. FIVE strands of 14 feet each, for a total of 70 feet black and white paper garlands. Each of the 5 black and white garland strings is 14 feet long and can be cut to your desired party decoration length. There are roughly 58 - 2 dots per string. Festive decorations for a New Years eve party, retirement party, graduation party, over the hill 40th, 50th or 60th birthday, and so many black themed parties. 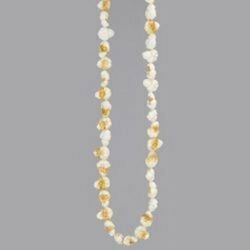 Bring a burst of summery detail to your home or party with this blossoming strand. 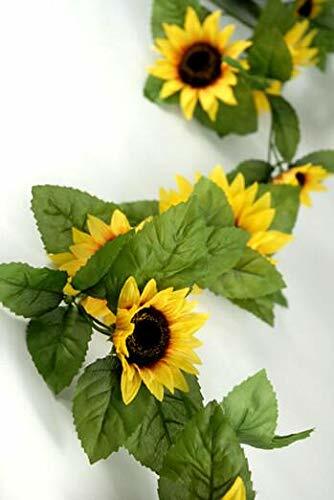 The Silk Sunflower Garland adds vivid color to its surroundings and will compliment cheerful decor. 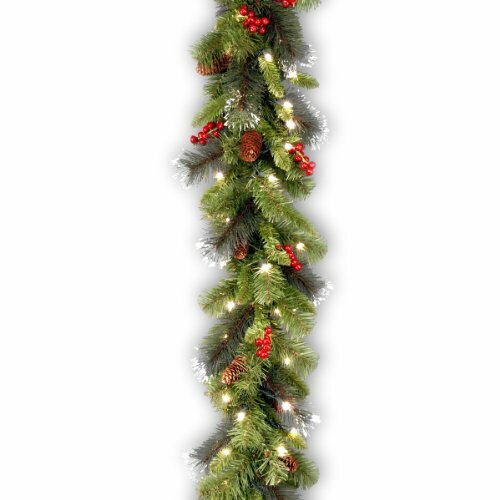 This garland is 6ft long x 7in wide. The center vine is wired. 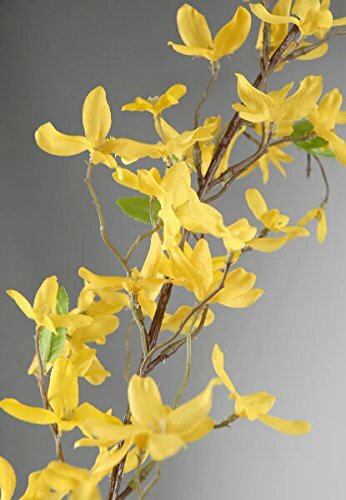 Individual flowers range from 2.5in to 4.5in wide.